Enjoy the beauty of Autumn and early winter in the Victorian High Country. Three Bedroom plus bed sitting room. Three and a half Diamond accreditation. Ideal for large family, two families, family with grandparents, 3-4 couples and group of up to 12. Full kitchen + lounge, laundry, heating, aircon, drying facilities, sun deck, pleasant tree shaded garden in summer, BBQ and pergola, 2 toilets, 2 showers, dressing table mirror and hair dryer in each bedroom, additional bathroom facilities in laundry, broadband, Wi-Fi hot spot, TV with HD Media Player & SD PVR, DVD Player, carport and 2 car garage. 310 Litre Frost free fridge (2), combo Microwave/Convection oven, full upright electric stove/grill/oven, electric frying-pan, electric snack toaster, 4 slice pop-up toaster, waffle iron, 6 saucepans, fry pans, baking trays, casserole dishes, cordless kettle. Full kitchen inventory on our website. Cot, High Chair, Child's Toilet Seat. The accommodation will very comfortably accommodate eight persons for an extended booking, and can be appropriately comfortable for up to ten persons for a weekend booking.The maximum accommodation capacity is twelve persons. However we advise against more than ten for more than one night of your stay. With more than ten guests expect to need to be efficient in the use of bathroom and kitchen facilities. Floor plan on our website, and see image gallery above. Even more photos on our website. The kitchen is very well equipped with utensils and appliances and we provide guests with some specific suggestions on how to make the most of the compact food preparation bench space. Australia's mountain bike capital. Closest town to Falls Creek alpine resort, gateway to Alpine National Park in the foothills of Victoria's highest mountain and adjacent to state forests. Only 30 km to Falls Creek and Bogong High Plains. Mountain biking from the door or in National Park. Ideal base for road cycling alpine climbs and the Queen Victoria three peaks loop. Free guide to Cool Climate regional winery tour and local cellar door winery cafes. Downhill and Nordic skiing at Falls Creek resort, ski touring on Bogong High Plains. Home of the Kangaroo Hoppet international ski race, with detailed skiing advice on our website. Year round mountain biking in lower forests and summer biking from the High Plains. 38 suggested rides on our website. Guests can download 12 ride guides. Year round walking. Also road cycling including Queen Victoria circuit, with suggested routes on our website, hang gliding, fishing, tennis, golf, bowls, gold mining towns. Accredited Cyclist Froendly Accommodation. We are a family of skiers, cyclists, mountain bikers, walkers & fishermen we love the mountains and the Kiewa Valley as a base to do these holiday activities. We understand the facilities that guests need to enjoy these activities and so we particularly cater for these needs. Over 40 years ago our family looked for our ideal location for a holiday house and settled on the Kiewa Valley as the perfect choice. Every time I drive down over the mountains for the glimpse into the Kiewa Valley be it snowing or sunshine the view of the mountains brightens my day. Over the years we have done many renovation and upgrade projects to make Kiewa View more comfortable and convenient for us and our guests. However we have kept some of the unique nostalgistic pre war style like the panelled internal doors. While many other holiday houses have changed to serviced apartment style holiday letting we have decided to stay with the traditional holiday house format where guests bring their own linen. Thus giving a choice to those guests who want to continue to avail themselves of the cost saving advantage of avoiding the expensive linen hire for eight beds, three bedrooms, kitchen and two bathrooms. We always believed that for a snow sports weekend break staying in Mount Beauty was more convenient and practical than staying on the mountain. The fact that it cost so much less was an added bonus. The fact that there are now mountain bike trail heads at both Falls Creek and Mount Beauty is just perfect. 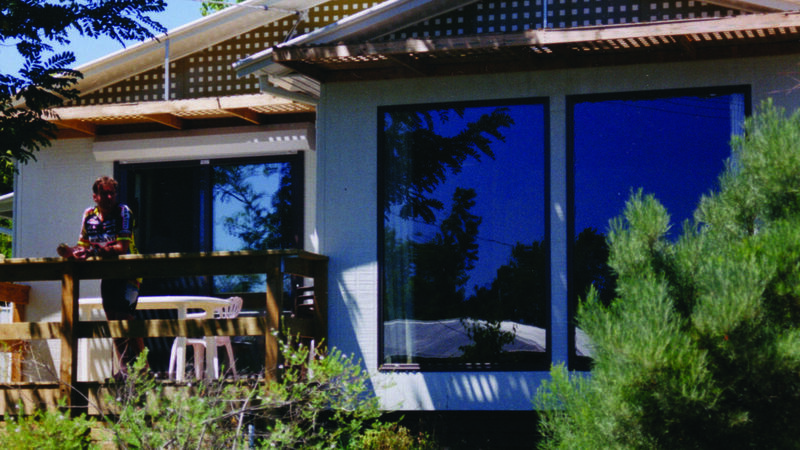 At kiewa View our focus is on exceeding guests expectations for three and a half star standard in comfort and convenience at a value for money price for active guests. At Kiewa View we have split systems in every room for year round comfort, excellent drying facilities, under cover parking for three cars and unloading out of the weather. There is a garage for under cover maintenance and storage of bicycles, a track pump and bike cleaning facility. Fish cleaning facilities so you can enjoy your catch cooked fresh. There are two showers and two toilets for quick transition from the end of activity to the start of relaxation at the end of the day. For that end of activity relaxation Kiewa View has a sun deck and pergola area as the golf course 19th hole only a short walk from the course. And when the post activity celebration is all done there is top quality bedding for a restful nights sleep recharged for the next days activities. Every bedroom has a dresser with hair dryer to reduce bathroom congestion . The area adjacent to the main toilet has a basin, mirror and hair dryer to further reduce congestion for larger groups. Excellent heating including towel heater. Drying cabinets suitable for ski gear with boot drying racks. Also useful for cyclists and other outdoor active guests. Two full size refrigerators. That essential drinks fridge. Detailed instructions on fridge below microwave. Full crockery, cutlery and cooking utensils for up to 12 persons. A number of large and very large pots to cook for a larger group. Full kitchen with Stove, microwave and electric fry pan. It is suggested that families with small children bring a small rope to secure gate for an enclosed garden play area. Rental available from Rocky Valley Sports. A few minutes ride to Big Hill Mountain bike park and halfway between Falls Creek & Bright parks. Glass doors directly of the kitchen. Children can eat on the deck and abults can eat inside. Falls Creek alpine village is 30 km. Each car-park has close to lifts and runs access and public heated shelter with facilities to eat own lunch and free showers. We especially cater for active guests with specific facilities for cyclists, mountain bikers, skiers, fishermen, golfers, as well as general sightseeing and winery visits. Local community pool less than 1 km. Also river swimming and tube riding close to Mount Beauty. We have particular focus on active guests with facilities for snow sports, road cyclists, mountain bikers, walkers, wineries. Access to our website with guides and maps. Thanks again Kirsty for your kind comments. We would be delighted to have you Boomerang back maybe in another season, for cycling, mountain biking, fishing, walking, wineries or something. The house was great. Plenty big enough for 8 people and all their bike gear. Thanks!